A night with the orchestra has never been something to laugh at; until now. Throw out everything you thought you knew about classical music as music and comedy collide. 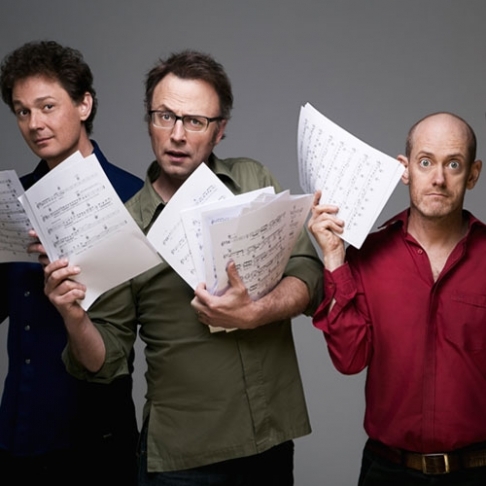 Veterans of musical comedy, Tripod – Scod, Gatesy and Yon – battle it out with the MSO over a night of symphonic sensations, heavenly harmonies and magical melodies. Tripod will take their cues from legendary composer Leonard Bernstein, adding their unique and side-splitting interpretations on some of the master’s best work. MSO Associate Conductor, Ben Northey will lead the Orchestra against the formidable, three-headed comedy juggernaut. It’s a school night, so book the babysitter! Make a night of it by joining Tripod and host Andrew Pogson as they discuss all things orchestral with Associate Conductor, Benjamin Northey, alongside some special MSO guests for a live edition of their Perfectly Good Podcast.